Spike Jonze enters the mind of the master thespian on Blu-ray in May. In an early announcement to retailers, the Criterion Collection says 'Being John Malkovich' is coming to Blu-ray on May 15. Have you ever wanted to be someone else? Or, more specifically, have you ever wanted to crawl through a portal hidden in an anonymous office building and thereby enter the cerebral cortex of John Malkovich for fifteen minutes before being spat out on the side of the New Jersey Turnpike? The Blu-ray will feature a 1080p transfer, DTS-HD Master Audio 5.1 soundtrack, and supplements include: New selected-scene audio commentary featuring filmmaker Michel Gondry; New behind-the-scenes documentary by filmmaker Lance Bangs; Conversation between John Malkovich and humorist John Hodgman; Director Spike Jonze discusses Being John Malkovich via photos from its production; Two films within the film: 7½ Floor Orientation and “American Arts & Culture” Presents John Horatio Malkovich, “Dance of Despair and Disillusionment”; An Intimate Portrait of the Art of Puppeteering, a documentary by Bangs; Trailer and TV spots; A booklet featuring a conversation between Jonze and pop-culture critic Perkus Tooth. 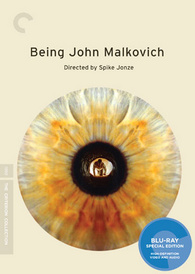 You can find the latest specs for 'Being John Malkovich' linked from our Blu-ray Release Schedule, where it's indexed under May 15.